Chamomile is much-used in aromatherapy with properties similar to lavender. The flower is soothing to mind and body with an apple-like fragrance. This variety of Chamomile flower is Matricaria recutita (syn. M. chamomilla), known as German or blue chamomile. We had a minor disaster a few months ago: flooding in our DaisyShop workshop. Of course we were insured, so it was just a bit inconvenient having to replace some of our stock. One of the casualties was a full 12Kg box of dried chamomile – the cardboard soaked up the floodwater like a sponge. Not wanting to waste good (if slightly damp) plant material, I took it home and tipped it onto the compost heap. Then in the Spring, I spread the compost on our vegetable patch, and now (quite unexpectedly) there is a sea of chamomile flowers growing! 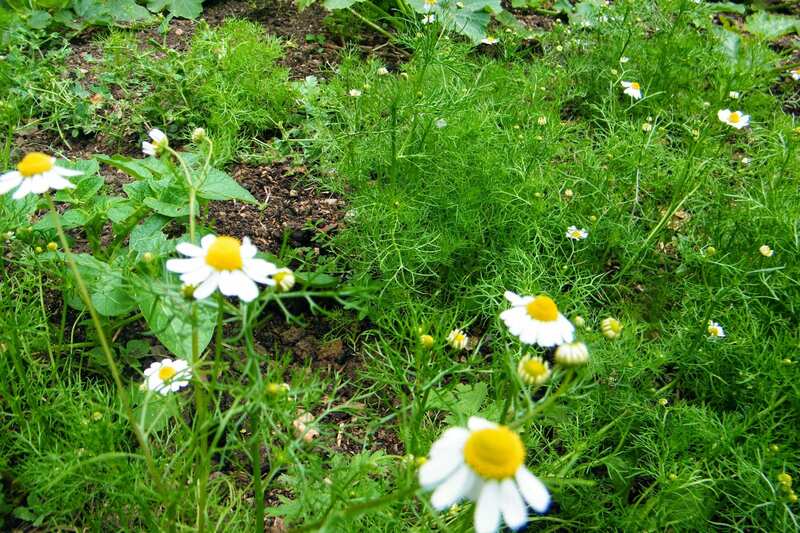 These Chamomile flowers are growing in my veg patch – with potatoes and courgettes just visible. 2. In the bath – fill a cotton pouch with the dried flowers and leave to soak under the hot tap. The chamomile will permeate the water, soothing the skin as well as the mind. If you like, you could combine with dried lavender and oats in this moisturising bath bag. 3. In potpourri – the clean fruity scent of chamomile would combine well with citrus for a potpourri kept in the kitchen. For a soothing bedtime mix, combine with lavender – just put equal quantities of the dried flowers in a bowl. If the fragrance fades, add a drop or two of essential oil to the mix, which may also boost the relaxing properties of the flowers. [Take care to follow instructions provided with essential oils, such as not to use them undiluted on the skin]. 4. In a sleep pillow – Fill a bag with equal quantities dried lavender and chamomile and keep under your pillow for a good nights sleep. 5. A chamomile hair rinse for blondes – Make a full pot of chamomile tea as described above, but use it in the final rinse when you wash your hair. It will add natural golden tones to blonde hair. Dried chamomile is very similar in its uses to dried lavender, and works well with it. Check out my ten uses for dried lavender and ten ways to relax with lavender, or make lavender tea. 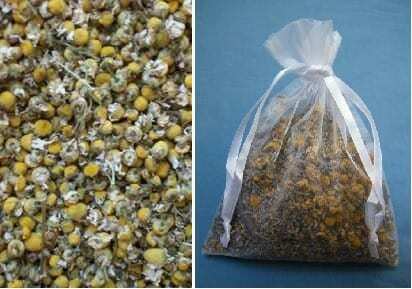 At DaisyShop we sell loose dried chamomile flowers which are suitable for all the applications above except the first one – ours is not for food use.